You may hear someone say, “I have an ulcer,” or “I got wounded.” It is quite confusing to distinguish the difference, most especially if you are not medically inclined. The topic of wounds and ulcers is so extensive. The coverage is so wide depending on the type. For example, ulcers can occur internally as well as externally. A person may have a peptic ulcer disease, ulcerative colitis, pressure ulcer, or the like. On the other hand, many types of wounds occur externally, which can penetrate deeper into the underlying tissues. Some examples of this are a lacerated wound, a stab or penetrating wound, a heart wound (you know—the kind of wound you get when you are emotionally hurt) and so on. But we won’t focus on the emotional aspect of it; instead, we will dwell more on the physical ones. For the sake of clarification, below is a discussion of the differences between skin ulcers and wounds. A wound is caused by an injury that damages the skin layers and tissues due to many factors. Wounds are categorized into two types, open and close. They can also be acute or chronic (non-healing) wounds, depending on the health status of an individual. Close wounds have fewer categories and are often caused by trauma, blunt force, and contusion. Clean wounds are caused by sterile surgical procedures. 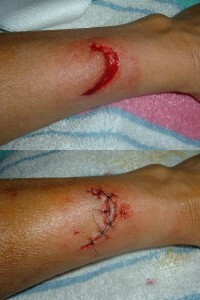 This type of wound usually heals faster under normal conditions. Infected wounds are wounds that are infected by bacteria, virus, or fungi. These wounds appear reddish, painful upon palpation, and sometimes oozing pus. If no prompt treatment is rendered, this can lead to systemic infection. When a wound is exposed to pathogens and other foreign substances but show no signs of infection, it is then classified as a contaminated wound. 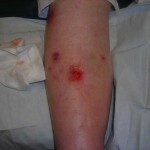 Colonized wounds are chronic wherein there are multiple pathogens present in the wound. This occurs frequently in patients who have diabetic foot and pressure ulcers. An ulcer is actually a type of wound if it is located externally. It is a sore on the skin or the mucous membrane. Most often, ulceration occurs in the gastrointestinal lining. However, it can also occur in any part of the body. Externally, ulcers frequently appear on the lower extremities, the sacral and the back area. In extreme cases, tissue integration on the epidermis is noted, and it can even extend to the dermis and the subcutaneous fat. The skin is very vulnerable. Dragging it against a surface, especially when it is moist, can cause tissue injury that can later on lead to ulcers. This occurs more frequently with paralyzed and comatose individuals. Pressure and stasis impede the blood flow and damage the underlying tissues that are pressed against the surface, resulting in tissue death and ulceration. One example of this is when you elevate a patient on the bed with the skin being pulled in an opposite direction that stays in place—causing injuries on the underlying tissues and blood vessels that make the specific area prone to ulcer. It is a given that some wounds and ulcers can “scar” you for life. But knowing the difference between the two can save you unnecessary suffering, stress, and disappointments. Important information about the conditions can put you right on track so you can get the proper treatment and therapy in order to regain your whole well being. Jade Sison. "The Difference Between a Wound and an Ulcer." DifferenceBetween.net. June 18, 2015 < http://www.differencebetween.net/science/health/the-difference-between-a-wound-and-an-ulcer/ >. It may be fair to add that a wound is generally considered to be due to an external factor – largely trauma, surgery, etc – while an ulcer is usually associated with an underlying condition or comorbidity, such as diabetes (diabetic foot ulcers) or arterial and venous diseases (arterial ulcers, venous statis ulcers).